When I recently asked a coworker how she was doing, she responded with, "Overwhelmed... but I guess that's better than being underwhelmed." I had never really considered those two concepts on the same spectrum before. 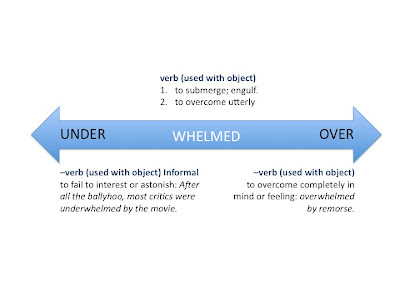 So I looked up the definitions for the two varied extremes, learned the meaning of the root word "whelm," and created this quick visual. At first, I totally agreed with my coworker's observation. After all, I would rather be a stressed out than bored. But the more I thought about it, both directions on the whelm gamut can lead to a drastic or unpleasant state. For me, the sweet spot is just to the right of whelm - engulfed and engaged in your roles and responsibilities, and in slightly over your head for that extra challenge and push to keep growing. WHAT ABOUT YOU? Where are you on the spectrum? Ideally, where would you like to be? What's the best way to get there? I would love to read your perspective in the comments.